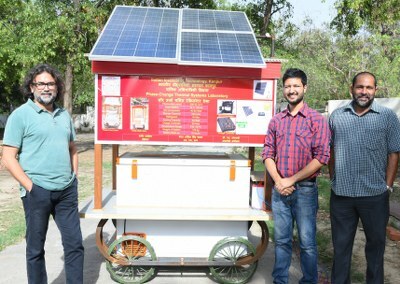 The Refrigeration and Air Conditioning Laboratory of IIT Kanpur has developed a portable refrigeration cart (thela) that is totally powered by the Sun’s energy. The prototype has been developed by Lt Col Akhil Singh Charak, M. Tech student of the Department of Mechanical Engineering, under the guidance of Prof. Sameer Khandekar, Laboratory Coordinator and Chandra Shekhar Goswami, Technical Superintendent of the laboratory. 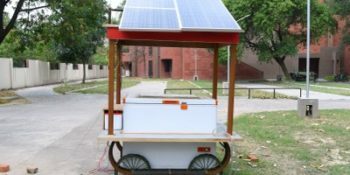 The aim of this Solar Photo-Voltaic (Solar-PV) based energy self-sufficient smart cart/thela with inbuilt refrigeration system is to provide a portable cooling system for multiple possible uses. Research clearly indicates a disproportionate portion of the fresh produce gets wasted annually in India, which could be conserved if proper refrigeration during transportation and storage is taken care of. “Hence, such solar driven refrigeration carts will prove to be vital in energy conservation as well as preserving perishable food items. This system can become an important value addition to the supply chain network and can also be coupled with an e-rickshaw by the users”, said Lt Col. Charak. He said that this mobile thela system will also be extremely helpful in the healthcare sector, especially in the rural areas. Many villages in India face a shortage of life-saving drugs and vaccines because of the lack of a cooling system. Since this cooling cart does not require any grid electricity to run, it is ideally suited for rural health care centers, especially in areas where electricity is available for only a few hours in a day. The system’s battery also ensures that the refrigerator is powered even on cloudy/rainy days. He also informed that this mobile system can even be used by the Indian army in remote areas. The inbuilt refrigeration system working off-grid will improve supply chain management by reducing spoilage of perishable food items. The design of the cart includes solar panels fitted at the top, a battery that stores the energy for use when the Solar energy is not available, a DC operated compressor, charge controller and energy meter. 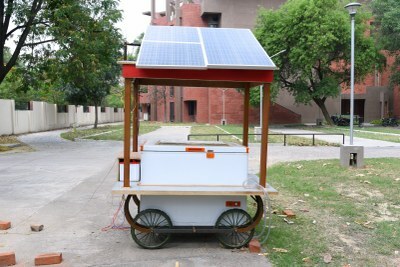 The solar panels provide shade from direct sunlight to the refrigerator as well as the individual using the cart. The panels are mounted on a flexible platform and can be adjusted manually in a suitable direction to get maximum sunlight, hence producing maximum electricity. At present, this 240-liter refrigerator can achieve a minimum temperature of -12°C and has a battery backup of more than 24 hours. 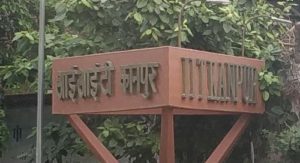 “This project is in sync with the Government of India’s National Solar Mission and Smart City Initiatives, and has the potential to revolutionize the life of millions of street hawkers and to generate employment for many more. We hope to continue working to develop such India specific green products using translational research and development,” said Prof. Khandekar. “In the first phase of development, the cart has been tested under various weather and loading conditions. In phase two, we are planning to deploy the unit with the help of some volunteers to get pilot level data, and hence improve the system based on feedback from street vendors,” said Chandra Shekhar. Prof. Khandekar also stressed the importance of such translational research and development work, which is very relevant to our country’s energy needs. He explained that this green energy operated refrigeration system has been designed and then assembled by using parts already available in the open market today. Chandra Shekhar added that the system uses Direct Current (DC) operated compressors, which should be indigenously manufactured as their demand will grow with increasing solar energy penetration.